The electrical design and planning of the on–site generation system is critical for proper system operation and reliability. This chapter covers installation design of the generator and related electrical systems, their interface with the facility, and topics regarding load and generator protection. One key element for understanding and communication of the electrical system design is a one–line diagram such as the one depicted in Figure 1 below. The electrical installation of the generator set and its accessories must follow the Electrical Code in use by local inspection authorities. Electrical installation should be done by skilled, qualified, and experienced electricians and contractors. This section provides examples of typical electrical system designs used in low and medium/high voltage on–site power generation applications. It includes descriptions of different methods of generating at medium voltage such as the use of transformers in single and multiple generator configurations. While it is impossible to show every combination; the designs presented in this section are often used. Several of the designs presented include paralleling capabilities and a brief discussion of the merits and risks associated with paralleling is provided. Because the use of transformers is widespread for medium voltage power generation, we have included a topic on these devices and the factors that are involved in choosing the right transformer. Electrical System Designs tend to vary considerably based on the needs, or primary functions of the power generation equipment in the application. A system design that is optimized for emergency service situations will generally not be the best that it can be for interruptible service and is definitely not the same type of system design as might be seen in a prime power application. The single line configuration differences are easy to see. 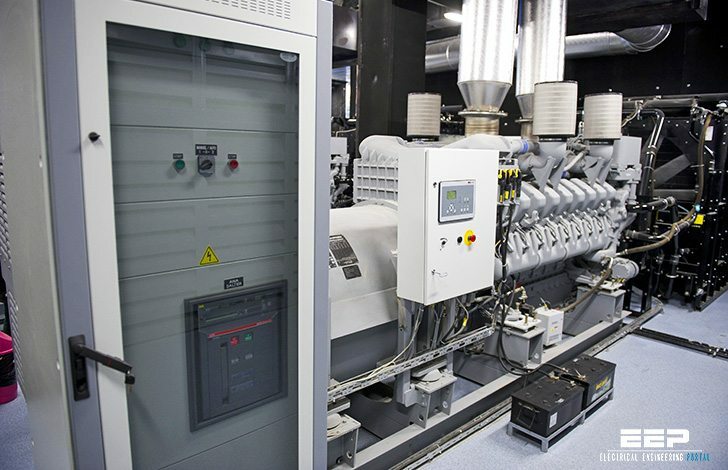 For example, in prime applications the gensets are at the ”top” of the distribution system while in standby and especially in emergency applications the gensets are connected to loads toward the ”bottom” of the distribution system. Power transfer points in prime applications tend to be at the top of the distribution, switching large blocks of load, often with circuit breaker pairs while emergency and standby systems often utilize transfer switches located further down in the system. Other differences are more subtle. Protection in a standby system is minimized in favor of greater reliability while in prime power we tend to move toward greater emphasis on protection of equipment. Coordination is often more of a concern in emergency applications. In standby applications grouping of loads might be commonly done based on location of loads within the facility, while in emergency applications, the grouping is based on priority of service. In any system design, local codes and standards will have a significant impact on the overall system design, hardware, and other application details. Local codes and standards should always be consulted prior to undertaking any design or modification work. This section is intended to cover these major points and other details, to provide general guidance on power system design.